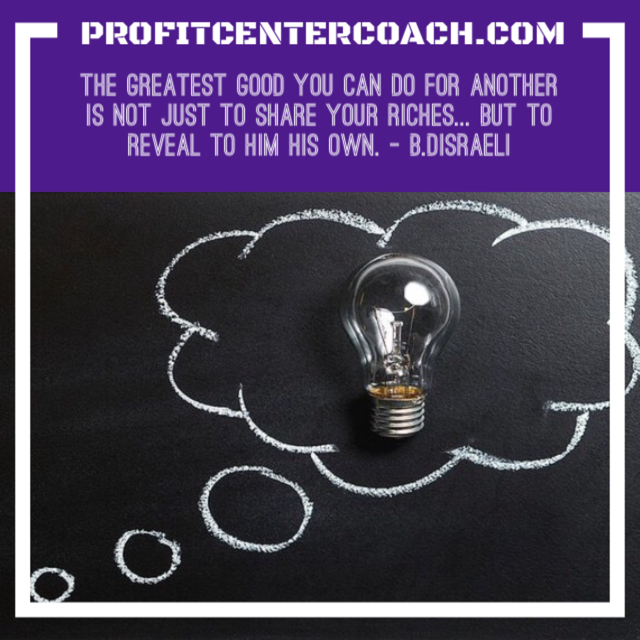 When I say, “Teach your secrets” – I want you to take someone down their journey of discovery. There’s a great episode of Friends where Phoebe, who gives massages as her chosen career, decides to teach a self massage course and the next week has no clients. So… I don’t mean give away your secret sauce but I mean offer help. This could be way of a seminar, class, or even one-on-one session. One of the greatest compliments is if someone asks, “how do you do that”? Clearly, you’re on the right path and take others with you. When we compete on creative vs. the competitive plains we all win. Read Wallace Wattles, “The Science of Getting Rich”… you won’t be disappointed. This is true, if you compete on price you’ll enter a downward spiral, you need to focus on your features and benefits. This is what brings me to today’s quote. Learn to take your customers down their journey of discovery. Sell the “sizzle” not the “steak” – seriously… let’s say you sold steak. Where are they eating it? Are they at a nice restaurant with the love of their life, or is it at home with family. You see, the steak isn’t the exciting part, the emotions surrounding the steak is the reason they buy. Most people are doing research on the internet prior to buying so if you ramble off the features of the dryer instead of, we’ll have it in your house tonight so you can quit taking your clothes to the Laundromat, you’ll win! Help your customers visualize using your product. 2- You know what it does and what the features are… but what problem does it solve for your customer? Focus on that problem. The next time a customer comes into your store, calls you on the phone, or sends an email. Start your conversation by solving that problem! Take your customer down that path to self discovery!